Delhi’s air quality is so bad that it is considered an improvement when it changes from ‘severe’ to ‘very poor’, quips Sunita Narain, director of the Centre for Science and Environment (CSE), a Delhi-based non-government organisation. In winter, Delhi’s air pollution fluctuates between poor and severe every other week and takes a turn for the worse when wind speeds fall and a dense fog settles over northern India. Amid rising concerns over health effects and limited success tackling smog, atmospheric scientists are attempting to track polluting particles to help combat Delhi’s pollution. The source of Delhi’s pollutants is a mix of emissions from vehicles, coal-fired plants and industries such as cement and steel. Added into this mix are agricultural emissions from burning crop stubble, as well as rubbish. These emissions are aggravated by natural forces such as dust blowing into India from deserts to the west. 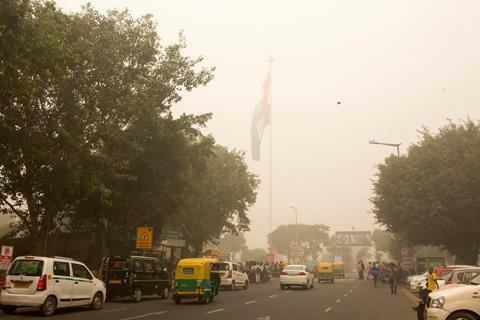 The November smog in Delhi last year, for example, was worsened by a dust storm in west Asia, according to a study by the Indian Institute of Tropical Meteorology, Pune. The first comprehensive assessment of the current and predicted toll that air pollution takes on the health of Indians has just found that, in 2015, particulate matter from transport and burning of biomass and coal was responsible for about 1.1 million deaths, or 10.6% of the total number of deaths in India. The study also warns that if no action is taken exposure to particulate pollution is likely to increase by more than 40% by 2050. At the end of last year a high-level task force created a draft action plan to curb air pollution in Delhi. It targets microscopic airborne, inhalable particles called particulate matter (PM) for monitoring. These are generally classified as PM10 or PM2.5 depending on whether they have diameters of 10μm or 2.5μm, respectively. PM2.5 can settle deep in the lungs causing severe breathing problems, heart and lung disease, hypertension and lung cancer. The results of this study chime with The Lancet’s 2017 special issue on pollution and health in south-east Asia. Pakistan, Bangladesh and India had the highest number of deaths caused by air pollution, with more than 130 deaths per 100,000 people. By comparison, China, well known for its smog-choked cities, recorded 84 deaths per 100,000. But Delhi is not an isolated pocket of pollution. ‘Air pollution is a pan-India problem,’ says Chandra Venkataraman at the Indian Institute of Technology (IIT), Bombay. She notes that it is particularly pervasive throughout the Indo-Gangetic Plain. Venkataraman’s team, who contributed to the 2018 assessment report, modelled annual average ambient concentrations of PM2.5 over India and found they varied from 25–150mg/m3. They also modelled population-weighted annual average exposure to PM2.5 and found wide differences, varying from 30–145mg/m3. However, all exceed World Health Organization (WHO) and US standards, and most exceed the Indian annual PM2.5 standard of 40mg/m3. Regional differences were noticeable with domestic biomass fuels responsible for much of north India’s air pollution problems. In the east coal is to blame, while in the north-west it is the burning of crop residues. Globally, Delhi ranks 11th in the WHO list of most polluted cities. Smaller Indian cities such as Gwalior and Allahabad have now overtaken it though. Half of the world’s 20 most polluted cities are now in India. Scientists at Atmospheric and Environment Research (AER), a scientific consultancy in the US, are conducting global studies on ammonia, sulfur dioxide and nitrogen oxides, which are important precursors to PM2.5. Ammonia reacts with acids derived from sulfur dioxide and nitrogen oxides to form PM2.5, AER scientist Karen Cady-Pereira explains. Cady-Pereira’s team found that emissions of ammonia in Delhi and Beijing are similar, but the levels of sulfur dioxide and nitrogen oxides are much higher in Beijing. ‘Ammonia reacts with acids derived from the other two to form PM2.5. However, if there is not sufficient acid for the ammonia to react with, it just remains in atmosphere.’ But as levels of sulfur dioxide and nitrogen oxides are expected to increase in India due to rising numbers of vehicles and power plants, PM2.5 levels will grow too. Meanwhile, researchers at IIT-Delhi are attempting to understand pollution build-up in and around Delhi using satellite data. 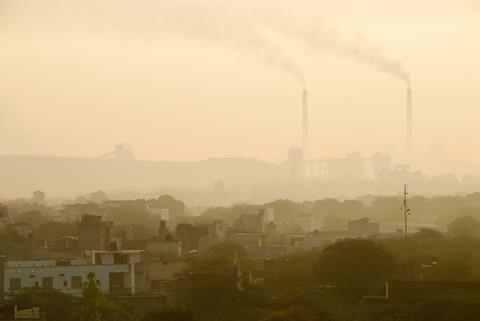 ‘We have generated 18-year statistics on PM2.5 using satellite data for over 100 cities in India,’ says Sagnik Dey, associate professor at IIT-Delhi’s Center for Atmospheric Sciences. This work has shown an overall increase in PM2.5, interspersed with two phases – 2002–2005 and 2009–2011 – when they fell. Dey says the first dip in PM2.5 levels was probably due to the Delhi government’s mandate that public transport use compressed natural gas in place of petrol and diesel, but scientist are unsure about the drop from 2009–2011. Dey’s team has also used satellite data to study how aerosols – such as haze, smoke, dust and other particles – absorb and block light. These aerosol optical depth studies help scientists assess air quality where ground-based measurements are scant, and where remote-sensing can complement the latter to provide regional coverage. Compounding the problem is a paucity of reliable country-wide data. ‘Official real-time monitoring is inadequate and most cities make do with an archaic, manual monitoring system,’ says Narain. CSE studies reveal that air quality is monitored in only 303 cities out of more than 6000. There has also been a drastic fall in the number of cities complying with air quality standards – from 13% of Indian cities in 2007 to 2% in 2016 – according to the CSE. Meanwhile, non-government organisations such as CSE and Delhi-based Urban Emissions recommend a slew of measures, such as promoting walking, cycling, public transport and cleaner fuels. Other recommendations include strict controls on diesel generators and burning refuse, and tighter emission standards for heavy industry. Urban Emission’s Sarath Guttikonda says that if these relatively simple initiatives can be rolled out then, it should be possible to begin to tackle India’s air pollution problems. Selective Switching technology - current scenario. * Performing the 1st Upgrade in an industrial ESP installed in Vitória/ES - Brasil, with partial conclusion scheduled for September / 2018. This will enable to be certified the effectiveness of the technology. * This ESP Upgrade will allow to retain 100% of PM 0.1 micron to PM 10 micron which is currently not retained. The mass of particulate that will be retained represents 60% of all current pollution released into the atmosphere. * Parallel to this, it is being initiated the construction of the 1st ESP containing the Selective Switching technology, which will be the ESP-SS. * Is under evaluation the purchase of an device, the ACI - Activated Carbon Injector - that will be installed in the ESP-SS, transforming it into the industrial filter to be called ESP-SS/ACI. * This ESP-SS/ACI, able to filter and retain 100% of PM 0.1 micron to PM 10 micron, will also be capable of filtering and retaining an immense amount of Gases produced in industrial processes, which today require retention systems of post-treatment, usually complex and very expensive. * In a 2nd stage, only possible in 2/3 years, with the improvement of Relay LP 100 KV, the ESP-SS/ACI will be able to retain 95% of the total of the current mass of PMs released into the atmosphere, since PMs less than 0.1 microns will also be withheld. *In this 2nd stage will be possible, also, the filtering and retention of 98% of all types of gases generated in industrial processes. * Several industries that use fossil fuels are in permanent contact with Company TCS Ltda, holder of the SS Patent, attentive the conclusion of the 1st Upgrade.